It’s that time of year when many of you are out of town. You want to get your runs in but sometimes safety is a concern when in a city you don’t know. Vegas hosts many marathons and races this time of year. It is easy to get distracted trying to experience all that new city has to offer. Ask at your hotel for recommended running routes. 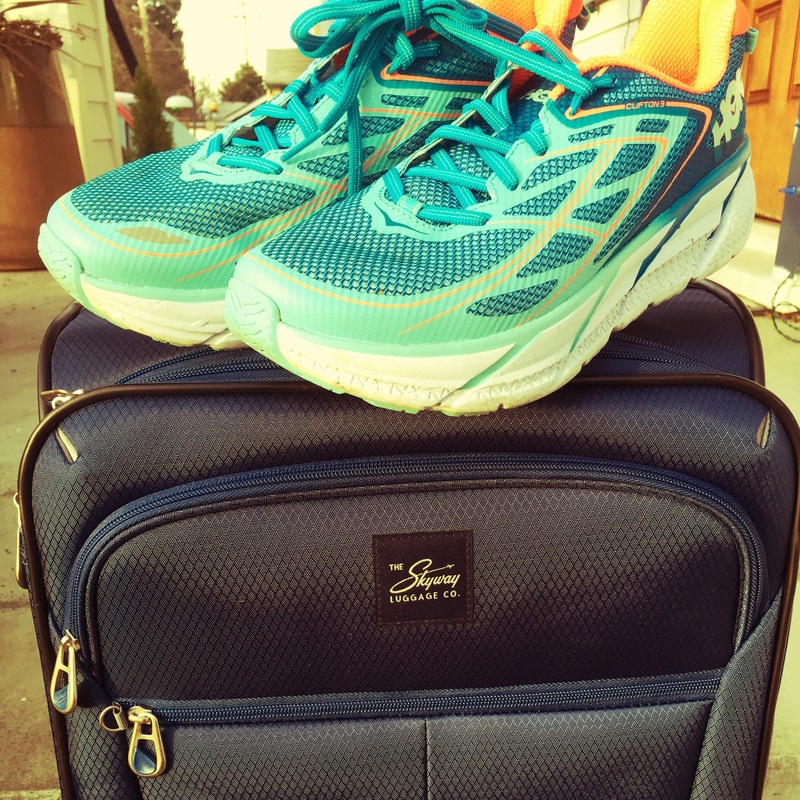 Many hotels can point you towards a local running route. Often these routes are fairly short but as workouts are often planned to be shorter on vacation, this can work! If you need a longer run, plan to do multiple loops to get the distance in. This also builds mental endurance which is a great skill to develop and you’ll need it on race day. If you absolutely need a longer run, a great resource is to ask at the local running store. They can easily point you to a good running course and will give you honest recommendations about what areas may be safer than others. As a bonus, sometimes you can even join a group run! The dreaded treadmill at your hotel gym is another easy way to get in a workout. if you aren’t used to running on a treadmill, it’s best to keep the running session short as there are some differences to running on the treadmill if you aren’t used to it. The gym at the hotel should also have other cardio machines like an elliptical. That is a great way to get in a workout without the pounding of running. When you are out running here are a few things to think about to make sure you stay safe. Carry your phone. If you have an app like “Find my Friends” enabled, you can set it so only trusted family and friends can see where you are at any given moment. Many find this to be an added sense of safety. If you are comfortable with carrying pepper spray, many running stores carry handheld pepper spray devices. Note that these devices are not allowed in carry-on luggage but a device with 4 ounces or less and with a safety mechanism to prevent accidentally spraying is allowed in checked luggage (check with TSA for current regulations). These devices can also work on stray dogs which can also be a concern depending on where you are traveling. The bottom line is get creative with your workouts, use the resources around you and stay safe. Don’t stress too much about any given workout as it is the holidays after all. Congrats to Chris K and Stephenie F. Both worked hard to fit the training in with their life and they both had amazing PRs at IronMan Arizona 2016 recently. We are almost into December and itt’s wet, cold and windy. Here’s some great inspiration to keep you motivated through the winter months! Chris was eager to learn and as a single dad, he had a very busy schedule. He realized that he could not fit all the training in and was smart about making the most of what he could accomplish. His love is soccer and he kept his regular soccer games in until the last month of training when the need to do some longer rides. He did his homework which is definitely required for an IronMan distance but managed to not get obsessed. Chris executed a great race day and then went off to celebrate at Disneyland! I can’t believe it! It was a great day to say the least. Super pleased with everything except missing the negative split on the run. I went out too fast and had a hard time slowing down until my body didn’t give me a choice. Thanks again for everything! To say your coaching paid off would be an understatement! Stephenie had great support from her family. She got creative and would ride around the campground while camping with family, she would run around soccer fields or between houses and meetings to get her workouts in. She struggled a bit with learning when to push more and when to back off as she hovered on the edge of over training. Mentally she wanted to push through some of the longer workouts near the end of the build but ultimately she understood that physically her body needed rest. She played and practiced with nutrition and gear. She asked great questions and worked very hard. I’m excited to be done! The swim made me nervous. It took me about 10 minutes before I could breathe without panicking. I made sure I was concentrating on going slow that first bike lap. It was pretty windy. It looked like that rain storm was trying to push in. So for the first lap, the wind was against you up the beeline, and then with you back down, so that helped make up for it. On the 2nd and 3rd lap, the wind changed directions and was against you on the way down. I couldn’t make up the time on the way down. The volunteers were amazing and so was crowd support. First time at the turn around, because of crowd support I honestly got really emotional and had to fight back tears. I loved this: they gave you a bracelet to give to someone (volunteer) to say thank you. I gave mine to a women helping me with my water bottle which I couldn’t get open, and help me with my CarboPro. Great idea! I wished I had 10 more of them!!! I was so excited to go through that chute, and have Mike Riley say my name! And I’m really excited about my time. It wasn’t my ultimate goal, but I PR’ed by over 50 minutes! No upset stomach after and no IV fluids like my last one. I had 3 slices of pizza, and then waited for my cousin to come in. I had my aunts and uncles there to cheer me on and my amazing husband. It was a very successful day. I wish I could sleep but woke up still too excited! Thank you so much for being an amazing coach. There is no way I could have done this without you! It happens to everyone at some point or another. Sometimes family, work and life conspire to derail us from our workout goals. Workout goals? It’s enough if you can feed yourself somewhat healthily, get the bills paid on time, continue to be effective in your career and have the occasional conversation with a loved one. I know everyone can relate to this. What do you do when you’ve signed up for a big event and still want to race as well as you can? As you may have noticed, this blog has been on a hiatus for a few months. That’s right. Life conspired and this blog had to be dropped. I’ve realized that over the years, life, work, training all take mental energy. I find that at my busiest, it is hard for me to invest some creative energy towards any extras. It’s galling to realize that no, I can’t do it all. I have to pick and choose and make sure I’m investing my time effectively when there is so much pressure in our time sucking world. It’s a slippery slope however. Sure you may still be able to get in your workouts with extra strength training and maybe a fun (sanity-inducing) exercise class. Maybe you’ve had to cut back on strength training or not. Stress and lack of sleep however can conspire to hamper recovery from these workouts. Sometimes, it may be best to go into a maintenance mode as not allowing for recovery can lead to burnout and injury. Take a break! Give yourself permission to take a few days of complete rest and focus on trying to eat and sleep well. Hopefully the extra time in your schedule plus a more focused mindset can help you catch up in life and/or work. If working out is part of what makes you feel sane, then it’s fine to go out for a workout but take it down a notch. Skip a scheduled workout and run or bike easily with no pace goals. Keep it short and lower the intensity to give yourself a chance to recovery. No, you are not being lazy! And no, beating yourself up because you do need a break is also not productive. It can happen to anyone and at anytime. After crazy hours at work and a fun but hard race, I found that I was just not able to run at a typical pace for me. Each run was slower and slower. Instead of forcing it, I took three days completely off and tried to sleep in AND take a short nap. I got caught up as much as possible with work and home responsibilities. I also ate well even though i was not burning all those extra calories. My body needed the extra fuel. I started sleeping better and overall was more focused and effective when I needed to be. I started back to workouts cautiously and was pleased I felt much better. It is a slippery slope and you can choose to step away from the edge! Congratulations to Pierre for a smart and focused race at the NYC International Distance Triathlon. Pierre got a new job at the beginning of May and has had to be focused about training. It’s been quite the learning curve in how to fit it all in but he has managed well. And race day was hot (above mid-80s/above 30 degrees Celsius) but Pierre maintained his cool even with some race day challenges and when the run course was shortened as a result of rising temperatures! What a day it was last Sunday for the NYC triathlon! I enjoyed every minute of it from my early move to the start line (2 hours before my actual start) to my finish in Central Park. I had a good feeling throughout the course despite hot temperatures. 40 K Bike: I felt good at start and I had power in legs. The downside was that I lost my second water bottle + my handlebars got slowly shifted from my front wheel. My mistake and I should have tightened my handlebars more. I am happy with my bike leg overall. Run: After a quick T2, I had no side stitch and good legs from the start. The temperature was approaching 95 F and the run had to be shortened to 8km because of the heat. With such a crowd in Central Park, it felt amazing. I pushed hard to stay close to 4mn/km but only manage 4mn30s/km. I am happy with my performance with further improvements expected on the run especially. I attach a picture from the race so you can feel how hot it was. It’s race season! And if you aren’t racing, you are probably also aiming to get in key workouts. A proper warm-up is key to a good workout or event. It prepares the muscles and joints in a more sport specific manner. A good warm-up enhances coordination and motor ability as well as revving up the nervous system. Finally, and possibly most importantly, it prepares the mind for the work ahead. Proper mental preparation for any sport is vital and the dynamic warm-up forces athletes to focus and concentrate on the task at hand. Your starting point should be an easy general cardiovascular warm-up lasting 10 – 15 minutes (or until you have broken a light sweat). This raises the body’s core temperature enough to enhance the elasticity of muscles, tendons, ligaments and overall joint structures and prepare you for the workout ahead. It is a time to focus and concentrate, leaving all outside distractions and stressors behind. It is time to put the phone down! Pendulum: Warms up and stretches the hip flexors, hip extensors, hip adductors, and hip abductors. Holding onto a stable object, swing leg forward and back. Then swing the leg from side to side. Lift leg as if going over a high object, forward and then backwards. Hacky sack touches: Warms up and and enhances mobility of all the muscles of hips and adductors. Lift right leg, sticking the knee out while you bring foot up to touch the left hand. Switch legs. Next, bring right leg up, sticking knee towards the center of your body and touch your right foot with your right hand. Step back and forward lunge: This exercise demands core stability, hip extension and glute recruitment. Step back with one leg so you are in a lunge position. Make sure your forward knee is properly aligned over the foot and your hips are squared. Step back your leg (do not push off with back foot, use your glutes to complete this motion) and then step forward for a lunge again. Again, make sure your knee is properly aligned over your foot and your hips are square. Only lunge as far as is comfortable for you. It does not need to be a deep lunge. These are just some of the many warm-up exercises you can do. As Coach has often said, don’t leave your workout in the warm-up! Warm your body up easily and prepare for what is ahead. Lucky Seattlites! Wherever you run, there is likely to be a hill. However, we know quite a few athletes who tend to limit their running routes to avoid hills. Proper hill running (both up and down) has some great benefits including building strength and teaching pacing. And we hate to break it to you but the secret to hill running is no secret. To be a better hill runner, you need to run hills. Then when you come to a hill in a race and everyone around you groans in horror, you will be ready! When running up a hill, you are working harder to overcome gravity. Your body is forced to recruit more muscles in your legs to carry you up the slope. That slope also alters your foot strike and biomechanics. 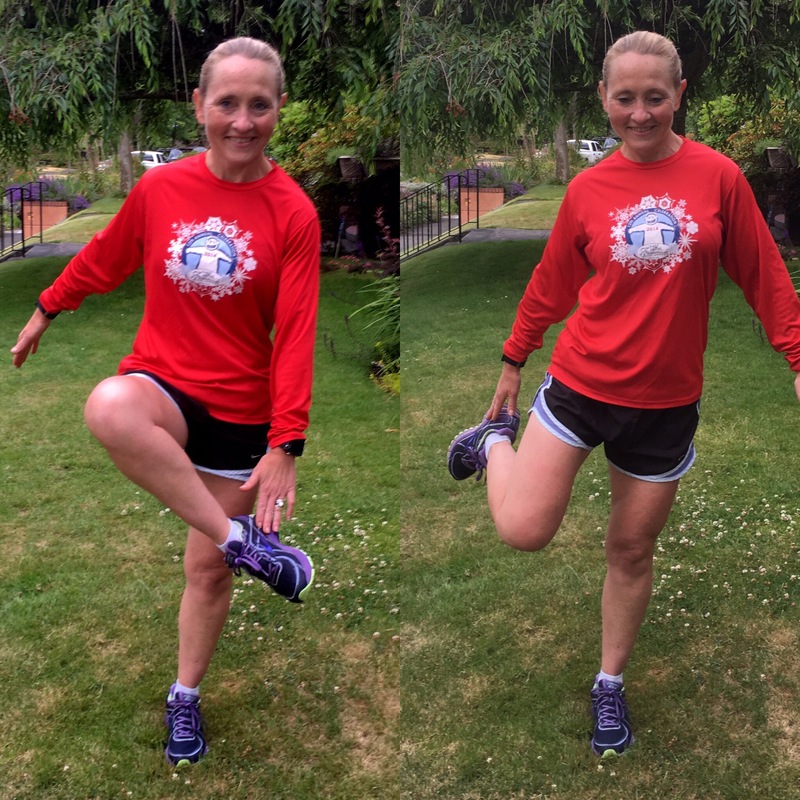 It forces you to transition to a mid-foot strike, stretches your calves as your heel goes below your mid-foot and increases the forces in your calves and ankles. That additional force in your calves and ankles can add extra power and elasticity that can lead to an increased ability to use the force to power you uphill. If you have issues in these areas, you should be careful and very mindful of the increased load. Many runners tend to lean into the hill when they start running up a hill. Some forward lean is necessary but many people lean far too much and hunch over. Leaning too far forward limits the ability to bring your knee up, limits the ability to push off with your foot and keeps those glute muscles we’ve worked so hard to develop from properly working. You should think of standing tall as you glide up the hill and remind yourself to keep your gaze up. Stay relaxed and use your arms. As you swing your arms, your legs will follow. Your cadence should be slightly quicker. Mentally, instead of cursing and grumbling about that dang hill, stay focused on quickly and efficiently getting past the top of the hill. Once you are hitting the crest of the hill, continue the momentum as you coast and start to recover. Many athletes lose focus once to the top of the hill. Instead continue to drive past the crest and let gravity assist you as you start to go back down the hill. What goes up must go down. Downhill running can be stressful to your body. It’s important to minimize the impact. The tendency is to lean back which acts to slow your speed. Leaning back also forces a heel strike which can put excessive stress on your legs, hips and back. Lean forward slightly and keep your cadence quick. Running downhill, your stride will cover more ground but still focus on quick, light feet making sure your hips stay over your feet. Running hills well during training and during races can be challenging. Hill running is a great way to develop a better sense of pacing. The biggest mistake we see in running hills is people charging up the hill. Instead of charging up a hill trying to hit a particular time, work to understand what a pace feels like when running on a flat course. Maintain that same effort as you go uphill. You will slow. You’ll make up some of that time (but not all) as you go downhill. If a hill is particularly steep or for longer ultra distances, it may even be better to walk on the uphill. Reframe walking and realize that you are power hiking! If you find that you are starting to work too hard for pace, you risk blowing up and jeopardizing the rest of your race. Everyone is different with regard to what feels right with effort. If you walk, remember to maintain the same focus and drive and mentally stay focused on moving forward. Instead of using the same muscles at the same pace, hill running forces you to use different muscles. Use this to stretch and give yourself a form check. As you get tired even when the course is flat, the clues to stand tall, use your arms, relax, pick your cadence up are all valuable form reminders. We also like to pretend that we’ve hooked onto a tow cable going up a ski mountain and visualize the boost. Uphill Cues Do this! Coach Lesley has her gaze up, she is standing tall. Do This! Here you can see Coach Lesley’s arms moving to assist propelling up the hill. She also has good right leg extension which engages the glutes. Don’t do this! Here Coach Lesley demonstrates a common flaw when running uphill. She is leaning far forward from the hips and has her gaze down. Do This! Coach Lesley has a slight forward lean that brings her hips over her knees and feet. Don’t do this! Coach Lesley demonstrates a common error with hill running. To slow her speed, she leans back. This puts much more stress on the knees, hips and back. And if the ground is very slippery, your leading foot can slip out from under you! Congrats to Rodrigo who completed his first marathon this past weekend in El Salvador. When I started working with Rodrigo the first thing he told me was that he wanted to become a better runner and do a half marathon (maybe a marathon some day) but most of all he wanted to know if I could help do this while maintaining balance with time for his family, work and life. He did not want a coach if we could not really take into account the time to be a dad. This hit a chord with me considering Balance is one of the words in the CoachLesley.com tag line and this is exactly what I meant when putting it in. For many athletes it is easy to get so focused on training and the goal that other things in life suffer. The road to the marathon was not easy but as anyone knows, it never is. Rodrigo did a fantastic job though of asking questions and listening to the answers. He learned about fueling for long runs, rolling on a foam roller, teraderm and body glide for chaffing and a host of other things. He also had some foot pain come on later in the training that made us back off and miss some of his long runs but, this is what allowed him to make it to the start line and run his race. Sure, those long runs might have made the end feel a bit better but if we had not figured out what was causing foot pain, maybe he would not have been at the start. Rodrigo, I am so proud of you! I am glad you had fun and I can’t wait to see what our next adventure will be. Celebrate your success and recover well. Thanks for your support, your tips, training plan, coaching, nutrition assistance and support. Now I’m a “maratonista” although not a fast one (yet!) but I’m one without any doubt!! Even though I have not met you in person I appreciate your support and commitment to make me a better athlete while also being a better person by helping me to balance training and make it fit in my personal life and work. We are in this together so we did it together!! !